Mudith obtained his BSc(Eng) in Materials Engineering from the University of Moratuwa in Sri Lanka in 1994 and gained his PhD from the University of Cambridge in 2001 for the thesis titled `Diffusional phenomena in nickel base superalloys'. He was a member of the Corpus Christi College, Cambridge and a former pupil of Royal College, Colombo. 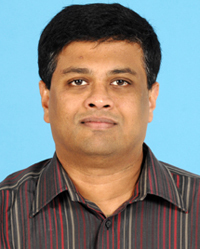 Mudith served as a Lecturer in Materials Engineering at the University of Moratuwa (1995-1996) and was a Research Fellow at the University of Southampton (2001-2004). While at the Southampton University he researched into the effect of carbon on dopant diffusion in semiconductor materials using defect injection and modelling techniques. Since 2005 he has been working as a Research Associate in the Department of Materials at the Loughborough University examining the microstructure evolution and life prediction in coated superalloy systems, using advanced computer modelling techniques. His current research is concentrated on the development of computer models based on diffusion, oxidation and thermodynamics to predict microstructure evolution in coated superalloy systems which are used in the hot zones of industrial gas turbine engines. He is also investigating the application of computer modelling to design new coating systems for superalloys. Mudith has considerable experience in the field of materials-modelling and software development for high performance computing. His wider research interests are measurement and modelling of diffusion in metals, intermetallics and semiconductor material, thermodynamics, phase transformation, solidification, microsegregation and oxidation in superalloys. Karunaratne, M. S. A., Ogden, S.L., Kenny, S. D. and Thomson, R. C., ''A Mulitcomponent Diffusion Model for the Prediction of Microstructural Evolution in Coated Ni-based Superalloy Systems'', Materials Science and Technology, 25(2), 2009, pp 287-299, ISSN 0267-0836. Karunaratne, M. S. A., Bonar, J. M., Ashburn, P. and Willoughby, A. F. W., ''Suppression of Boron Diffusion due to Carbon during Thermal Annealing of SiGe based Device Materials - some comments'', Journal of Materials Science (40 th Anniversary Special Edition), 41(3), February 2006, pp 1013-1016. Karunaratne, M. S. A., Willoughby, A. F.W., Bonar, J. M., Zhang, J. and Ashburn, P., ''Effect of Point Defect Injection on Diffusion of Boron in Silicon and Silicon-Germainium in the Presence of Carbon'', Journal of Applied Physics, 97(11), 1st June 2005, Art. No. 113531. Karunaratne, M. S. A. and Reed, R. C., ''Interdiffusion of the Platinum-Group Metals in Nickel at Elevated Temperatures'', Acta Materialia, 51(10), 11th June 2003, pp 2905-2919. Karunaratne, M. S. A., Carter, P. and Reed, R. C., ''On the Diffusion of Aluminium and Titanium in the Ni-rich Ni-Al-Ti System between 900 and 1200 Degrees C'', Acta Materialia, 49(5), 14th March 2001, pp 861-875. Karunaratne, M. S. A., Carter, P. and Reed, R. C., ''Interdiffusion in the Face-Centred Cubic Phase of the Ni-Re, Ni-Ta and Ni-W Systems Between 900 and 1300 Degrees C.'', Materials Science and Engineering A-Structural Materials Properties Microstructure and Processing, 281(1-2), 15th April 2000, pp 229-233. Karunaratne, M. S. A., Rae, C. M. F. and Reed, R. C., ''On the Microstructural Instability of an Experimental Nickel-Based Single-Crystal Superalloy'', Metallurgical and Materials Transactions A-Physical Metallurgy and Materials Science, 32(10), October 2001, pp 2409-2421.